Here are details of my upcoming and recent talks, with links to my post-talk blog reports. For more information on the subject, order my book, Black Tudors: The Untold Story (2017), and have a look at my articles, reviews and blog entries. ​BLACK TUDORS BOOK TOUR CONTINUES! Click on the links below to find details of the events, timings and how to book. BLACK TUDORS BOOK TOUR 2017-2018! Click on the links below to find details of timings and how to book. Thursday 26th October: What's Happening in Black British History? VII, Senate House, London. Friday 1st June Gerald Aylmer Seminar 2018- Diversity amongst the documents? The Mary Rose, c. 1546. Tuesday 17th January, 5.15pm, Maritime History and Culture Seminar, Room 246, 2nd Floor, Senate House, Malet Street, London, WC1E 7HU. When we think of Africans aboard Tudor and Stuart ships, we might think first of those enslaved by John Hawkins and his successors. However, while researching Africans in Britain, 1500-1640, Dr. Miranda Kaufmann has uncovered records that paint a different picture. Voyage accounts, High Court of Admiralty and other legal records, Privy Council documents and the letters of merchants, voyage investors and the East India Company reveal examples of African sailors, divers, translators, factors and circumnavigators aboard Tudor and early Stuart ships. In this paper, Dr. Kaufmann will tell some of their stories, and explore the questions they provoke, concerning how these individuals came to be aboard English ships in the first place, what their status was, and what became of them. Monday 5th December, 5.15pm, Tudor and Stuart History Seminar, Wolfson Room, Institute of Historical Research, Senate House, Malet Street, London, WC1E 7HU. Dr. Miranda Kaufmann will present some of the research from her forthcoming book, Black Tudors, exploring the lives of Africans in 16th and 17th century Britain, explaining how they arrived in Britain, what occupations and relationships they found and how they were treated by the church, the law courts and the other inhabitants of Britain. Wednesday 30th November, 5.15pm, Black Tudors, Arts 01.06, University of East Anglia, Norwich Research Park, Norwich, Norfolk, NR4 7TJ. ​Dr. Miranda Kaufmann will present some of the research from her forthcoming book, Black Tudors, exploring the lives of Africans in 16th and 17th century Britain, explaining how they arrived in Britain, what occupations and relationships they found and how they were treated by the church, the law courts and the other inhabitants of Britain. ​Thursday 27th October, 5.15pm, Institute of Historical Research, Senate House, Malet Street, London, WC1E 7HU. I will be chairing the final panel where we will discuss issues arising in the course of what looks to be a fantastic day of Black British History! For more on the agenda for 'What's Happening in Black British History? V' and to book your tickets, check out my blog. ​Thursday 12th November, 5- 8.30pm, Institute of Historical Research, Senate House, Malet Street, London, WC1E 7HU. Join Black Cultural Archives for our second Len Garrison memorial lecture. This annual lecture series is dedicated to Black Cultural Archives co-founder Len Garrison, who was an educationalist, activist and advocate for children’s education and teaching of black history. This year we will ask questions and explore some of the lesser known periods of Black British History. We will be joined by leading historians and experts in their field: Historian, producer and presenter of the recent BBC documentary series Forgotten Slave Owners David Olusoga, historian and writer Marika Sherwood, and freelance journalist and historian Dr Miranda Kaufmann. The talk will be followed by an audience Q&A opportunity. Wednesday 21st October, 3-5pm, ​Manchester Metropolitan University, OX.LB 01, 70 Oxford Street, Manchester, M1 5NH. Join us for an inspirational Black History Month discussion with Professor Alan Rice, Dr Miranda Kaufmann and Marcia X. What is Black History Month? Why do we need to celebrate it? Dr Miranda Kaufmann will offer a historical perspective on these questions. You will also hear an inspiration talk by Professor Alan Rice on the achievements of Black personalities in Manchester, whilst participating in a thought-provoking discussion of intersectionality with artist Marcia X.
Wednesday 14th October, 7.30pm, Eastbury Manor House, Eastbury Square, Barking, IG11 9SN. Explore the lives of over 200 Africans living in Tudor England, including John Blanke, Henry VIII's black trumpeter, Resonable Blackman the silkweaver, and Mary Phyllis, the Moroccan basket-weaver's daughter. Dr Kaufmann will explain how they arrived here, what occupations and relationships they found and how they were treated by the church, the law courts and the other inhabitants. Treforest Campus, Treforest, Pontypridd, RCT, CF37 1DL. One group within Tudor society that is rarely represented is the over 200 Africans who were living in Britain between 1485 and 1603 (and beyond). Their lives are a vital part of our understanding of the age in which England made her first steps into the murky business of colonialism. Their experiences shed light not only on the doings of men such as Sir Francis Drake, Sir Walter Ralegh, and Robert Cecil, who all had black servants, but ask wider questions about Tudor perceptions of race, religion and the ethics of enslavement. Despite the fascinating histories unearthed by scholars such as Peter Fryer, Imitiaz Habib, Onyeka, Michael Ohajuru and myself, the Black Tudors go largely un- or mis-represented in popular culture. This paper will analyse why, and make some suggestions as to how this problem could be rectified in the future. It will also explain why it is so important to include those of African descent to give a “full-colour” history of the Tudor age. Tuesday 11th November, 6pm, John Galsworthy Building, Room 3002, Kingston University, Penrhyn Road, Kingston upon Thames, KT1 2EE. I'll be giving a talk following Anna Brass and Lilly Mehbod's presentation of two short films about Cesar Picton based on records held in The National Archives and in Kingston’s Local History Room. 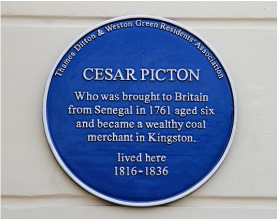 Cesar Picton (c.1755-1836) was just one of an estimated 10-15,000 Africans living in Georgian London. Some of his better-known contemporaries included Ignatius Sancho, Olaudah Equiano and Dido Elizabeth Belle, but many more remain unknown. What was the legal status of Africans under English law? How unusual was it for someone of African origin to achieve financial independence? What might Cesar’s portrait have looked like? In this talk, Dr. Miranda Kaufmann will explore these questions and others raised by Picton’s life, which spans a fascinating period in which over 6,000 slave trading voyages were carried out under the British flag before that trade and the status of slavery itself was abolished in the empire. The talks will be followed by a wine reception in Kingston University's Picton room. Free admission. Register to attend via Eventbrite. Read more about the event on the History@Kingston blog. Saturday 8th November, 3.30pm, Bloomsbury Theatre, 15 Gordon St, London WC1H 0AH. What makes a nation? What is national history? Who belongs in the story? Why does it matter? Stuart Hall once wrote that those that do not see themselves reflected in national heritage are excluded from it. The black presence in Britain has a long and rich history and yet black British history has often been marginalised and considered to be a post-Windrush phenomena. Common conceptions of British national history are often condensed into the familiar stories, such as those of the Tudors, Abolistionists, the two World Wars. These are some of the cornerstones of how we have come to understand ourselves as a nation. Focusing on areas which are part of the national curriculum, this event will explore how we can incorporate the stories of African men, women and children and their descendants. The event will also showcase some of the best of black British culture including readings by Andrea Stuart and S. I. Martin, as well as performances from Hackney students alongside their mentors Akala and Anthony Anaxagorou. This will be followed by an interactive debate on the role of national, global, and diasporic histories within education. This free event, which has been organized by the Legacies of British Slave-ownership project at UCL and Hackney Museum and Archives, will be held at the Bloomsbury Theatre on Saturday 8 November 2014 from 10 am and will be followed by a reception featuring music which arises from the African diasporic experience. See the full programme and register for your free place here. Thursday 30 October, 11- 6.30pm, Institute of Commonwealth Studies, The Chancellor's Hall, 1st floor, Senate House, Malet Street,London, WC1E 7HU. Thirty years after the publication of Peter Fryer’s Staying Power, immigration is still a hotly contested topic, while slavery continues to dominate popular perceptions of Black British History. New research is revealing different stories, but how is this being presented in Britain’s classrooms and museums? We need a conversation between those actively involved in researching and communicating the history of peoples of African origin and descent in Britain about what it means to us today. We invite you to join us at the first in what will be a series of workshops held once a term by the Institute of Commonwealth Studies. The aim is to foster a creative dialogue between researchers, educationalists (mainstream and supplementary), archivists and curators, and policy makers. It will seek to identify and promote innovative new research into the history of people of African origin or descent in the UK. Researchers and archivists will provide an introduction to the ever-growing body of resources available. We will also discuss the latest developments in the dissemination of Black British history in a wide variety of settings including the media, the classroom and lecture hall, and museums and galleries, thus providing an opportunity to share good practice. The workshops will consider a range of issues around Black British history including the way in which scholars have defined the field, debates around how and why it should be taught, especially in the light of the new national curriculum, and the tensions between celebrating the achievements of people of African descent in the UK and applying a critical perspective to the past. Read the Full Programme here, and for more information, see my latest blog, the ICwS Events page or Register Online here. Wednesday 29th October, 6.30pm, Paddington Library, 45 Porchester Rd, London, W2 5DU. Explore the lives of over 100 Africans living in 16th and 17th century London, including John Blanke, Henry VIII's black trumpeter, Resonable Blackman the silkweaver, and Mary Phyllis, the Moroccan basket-weaver's daughter. Dr Kaufmann will explain how they arrived here, what occupations and relationships they found and how they were treated by the church, the law courts and other Londoners. Free admission. Refreshments. Booking required. For more information and booking please visit Paddington Library, call 020 7641 6200 and ask to be put through to Paddington Library or email paddingtonlibrary@westminster.gov.uk. Wednesday 22nd October, 2pm, The Guild of Registered Blue Badge Tourist Guides, The Guild House, 52d Borough High Street, London, SE1 1XN. - by invitation only. Join Dr. Miranda Kaufmann on a virtual tour of London's Black History. Following in the footsteps of Africans who came to Tudor, Stuart and Georgian London: from John Blanke, Henry VIII's trumpeter, to Dido Elizabeth Belle of Kenwood, and now of Hollywood, Dr. Kaufmann's tour will take you from Greenwich to Westminster, Mayfair and Marylebone via City churches, Royal palaces and trading wharves. Discover along the way what brought Africans to London, how they were viewed in the eyes of the church and the law, and what roles they played in London's history. Wednesday 15th October, 6pm, Room 180, Queen Anne Building, Greenwich Campus, University of Greenwich, London SE10 9HX. Dr. Miranda Kaufmann will explore the lives of Africans in 16th and 17th century England and Scotland's port towns, explaining how they arrived in Britain, what occupations and relationships they found in the ports and how they were treated by the church, the law courts and the other inhabitants. Entrance fee: £2.50 for non-members of University History Society. The Image and Reality of Black Africans in Renaissance England, with Michael Ohajuru. Tuesday 14th October, 6.30pm,with Michael Ohajuru, Battersea Library, 265 Lavender Hill, London SW11 1JB. Why was there an image of a Black African King in English churches even though no Black African Kings visited Europe during the Renaissance? Was John Blanke the only Black African in England at the time? In reality, what else did or could Black Africans do beside play trumpet for English royalty? Join independent historians Michael Ohajuru and Miranda Kaufmann to find out! Monday 13th October, 7.30pm, Historical Association, Gloucestershire Branch, Friends Meeting House, Greyfriars, Gloucester GL1 1TS. Dr. Miranda Kaufmann will explore the lives of Africans in 16th and 17th century England and Scotland, explaining how they arrived in Britain, what occupations and relationships they found and how they were treated by the church, the law courts and the other inhabitants of Britain. 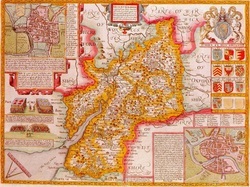 Special mention will be given to Africans living in early modern Gloucestershire, including Edward Swarthye of Lydney, the Ivye family of Dyrham, and Cattelina of Almondsbury. Saturday 11th October, 4.15pm, "Polish Witches and Black Tudors - tales from the 1500’s" with Wanda Wyporska, Archway with Words Festival, Worship Centre, Methodist Church, Archway, Archway Close, London N19 3TD. Dr Wyporska’s captivating book started with records of Polish witchcraft trials. Her comprehensive study of ‘demonology’ revealed many different versions of ‘witch’ - a harbinger of evil or an admirable housewife? Shattering assumptions, this talk will show that Everything You've Ever Been Told About Witches Is Probably Wrong…. Dr Kaufmann’s first book, ‘Black Tudors’ tells lost stories of that period, taking us aboard the famous voyage of the Golden Hind with the Africans who sailed with Drake, shedding light on encounters that led to the arrival of black people in Britain in the 1500’s and introducing us to remarkable characters such as Drake’s esteemed ally ‘Diego’. Wednesday 8th October, 6pm, Shepherd's Bush Library, 6 Wood Lane, London W12 7BF. Dr. Miranda Kaufmann will explore the lives of Africans in 16th and 17th century Britain, explaining how they arrived in Britain, what occupations and relationships they found and how they were treated by the church, the law courts and the other inhabitants of Britain. Tuesday 7th October, 6pm, North Kensington Library, 108 Ladbroke Grove, London W11 1PZ. Like any historical film "Based on a True Story", Belle takes liberties with the historical record. 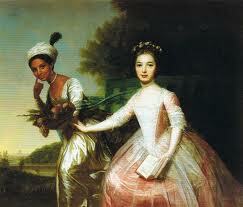 In this talk I will sift the fact from the fiction and discuss the life of Dido Elizabeth Belle in the context of other Africans living in Britain at this time, including Olaudah Equiano, who has a walk-on part in the film. I will also explain the legal history and significance not only of the Zong case featured in the film, but of Lord Mansfield's other famous cases, such as Somersett (1772). Thursday 17th July, 1.30pm, paper at Society of Early Americanists’ Conference, London and the Americas, 1492-1812, Kingston University. In 1572 the Spanish Inquisition in Mexico interrogated an English sailor named William Collins, abandoned by John Hawkins after the Spanish decimated his fleet at San Juan d’Ulloa in 1568. As part of his testimony he recounted a conversation he’d had with an enslaved African named Juan Gelofe. Gelofe told Collins: “England must be a good country as there were no slaves there.” Collins replied that: “it was true, that they were all freemen in England”. Gelofe challenged: “John Hawkins had been engaged in a cruise for slaves and was bringing them out here when he came to San Juan de Ulua.” How, he asked the English sailor, formerly of Hawkins’ crew, do you account for that? All Collins could reply was that Hawkins was “a gentleman of quality and influence in England”. 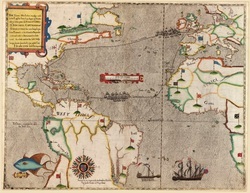 Examining the period from Hawkins’s 1560s slaving voyages to the sale of a cargo of enslaved Africans in Barbados in 1641/2, this paper will examine London’s connections with the Americas through the prism of the African experience. 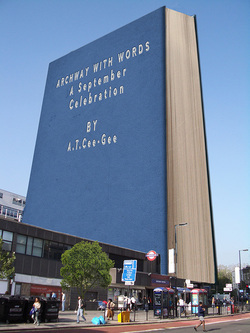 It will try to answer Gelofe’s questions more fully, by exploring encounters between Englishmen and Africans in the Atlantic world, and the lives of Africans living in London. It will show that Africans arrived in the city from the Americas as a result, not of English slave trading, but of privateering, which peaked in the years of war with Spain. It will also show how the situation changed as England began to establish her own colonies and Englishmen were no longer mere interlopers in a Spanish Atlantic world. Thursday 5th June, 7.30pm, Mold & District Civic Society, Masonic Hall, Earl Road, Mold, CH7 1AX. Friday 25th April 2014, 6.30 pm, Birkbeck Early Modern Society, room B18, Malet Street, WC1E 7HX. Dr Kaufmann gives an insight into the lives of the over 100 Africans living in Tudor and early Stuart London- what were they doing? How did they get here? What was their legal status? Titus Andronicus: the Peacham Drawing. Thursday 10th April, 12pm, Clemson Colloquium on Race and Ethnicity "Race, Memory, & the Present", Clemson University, South Carolina. Shakespeare was one of many Renaissance writers to feature black characters in his plays. Most famously, Othello, but also Aaron from Titus Andronicus, Caliban from The Tempest, and some would argue, Cleopatra. But what of the actual Africans living in Shakespeare's Britain? Dr. Kaufmann presents new evidence of over 200 Africans present in England and Scotland during Shakespeare's lifetime, and argues that they are a vital context for the discussion of Race and Ethnicity in Renaissance Literature. Friday 4th April, 3.45pm, Paper at African Diasporas: Old and New Conference, University of Texas, Austin. My archival research has uncovered over 360 Africans living in England and Scotland in the sixteenth and early seventeenth centuries. The impression of their lives that can be gleaned from parish registers, tax returns, household accounts, wills, letters and court records is more positive than those who trace attitudes to ‘race’ in literary texts such as Shakespeare’s Othello and Hakluyt’s Principall Navigations suggest. This paper will explore the various ways Africans came to Britain: from Africa, from Europe and from the Spanish Caribbean; with privateers, pirates, merchants, aristocrats and royalty. It will consider their status, showing that they were not enslaved in Britain, but gained a level of acceptance into society. They were baptised, married and buried by the Church of England, paid wages, and testified in court like the other inhabitants of these islands. Their stories challenges the traditional narrative that racial slavery was inevitable, imported to colonial Virginia from Tudor England, and forces us to re-examine the 17th century to find out what caused perceptions to change so radically. Tuesday 21st January, 5pm, Centre for European and International Studies Research (CEISR) Annual Lecture, University of Portsmouth, DS 2.14, Park Building, King Henry I Street, Portsmouth, PO1 2DZ. Dr. Miranda Kaufmann will explore the lives of Africans in 16th and 17th century England and Scotland's port towns, explaining how they arrived in Britain, what occupations and relationships they found in the ports and how they were treated by the church, the law courts and the other inhabitants . The Image & Reality of Black Africans in Renaissance England, with Michael Ohajuru. Tuesday 19th November 2013, 4pm, Room SL101, Stephen Lawrence Building, University of Greenwich, London SE10 9HX. A new presentation by two independent historians asking why was there an image of a Black African King in English churches even though no Black African Kings visited Europe during the Renaissances? Was John Blanke the only Black African in England at the time? In reality, what else did or could Black Africans do beside play trumpet for English royalty? King's Fountain in Lisbon, Netherlandish, c. 1570-80. Friday 8th November 2013, 2.30pm, Centre for Urban History, University of Leicester, Marc Fitch House, 3-5 Salisbury Road, Leicester, LE1 7QR. Dr. Miranda Kaufmann will explore the lives of Africans in 16th and 17th century England and Scotland's ports and cities, explaining how they arrived in Britain, what occupations and relationships they found in the city and how they were treated by the church, the law courts and the other inhabitants of urban Britain. Wednesday 30th October 2013, 6pm, Queen Mary History Journal, SCR, Arts 2, Queen Mary University of London, Mile End Road, London E1 4NS. Tuesday 29th October 2013, 7pm, G3, School of Oriental and African Studies, University of London, Thornhaugh Street, Russell Square, London, WC1H 0XG. John Blanke's world: The Image and Reality of Black Africans in Renaissance England, with Michael Ohajuru. The Great Chamber, Sutton House. Monday 21st October 2013, 7pm, Sutton House, 2 and 4 Homerton High Street, Hackney, E9 6JQ. Join historians Dr. Miranda Kaufmann and Michael Ohajuru in Sutton House’s Tudor Great Chamber as they explore the world of John Blanke, Henry VIII’s black trumpeter. Discover how Black Africans were portrayed in the art of the period and the contrasting realities of life for over 350 Africans in Renaissance England. The Bryck Place bar will be open for drinks before the talk and you can enjoy exclusive access to Sutton House’s historic rooms and new Influential Black Londoners exhibition. Friday 20th September 2013, 2.15pm, Imperial City: Bristol in the World conference, M Shed, Princes Wharf, Wapping Rd, Bristol, BS1 4RN. In October 1590, 135 Africans arrived in Bristol. The largest known group of Africans to arrive in pre-imperial England, they had arrived on a prize that had been brought into Bristol by her Majesty’s ship, the Charles, captained by Jonas Bradbury. The prize had on board a massive haul of 734 chests of sugar, and 13 hogsheads of molasses. Also onboard were 32 Spaniards and Portuguese. The Bristol authorities put the Africans up in a local barn for a week before swiftly shipping them back to Spain, asking Lord Burghley for £302 13s 3d to cover their expenses. One of over 200 reprisal voyages recorded in the three years immediately following the attack of the Spanish Armada in 1588, this expedition brought Bristolians into contact with two of the commodities that would make the biggest impact on their lives and their place in the world in the imperial centuries to follow: Africans and sugar. Using original documents from the Lansdowne Manuscripts, including the letter written by the Mayor of Bristol, William Hopkins to the Privy Council, and an attached set of accounts written by his Chamberlain, this paper will explore this unusual incident, placing it in the context of other encounters between Africans and privateers, the records of 16 other Africans living in Bristol c.1560-1640 and the wider context of over 360 Africans in Britain between 1500-1640. 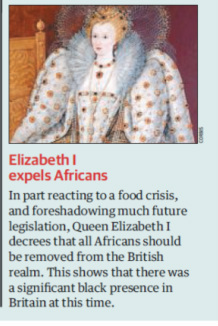 The paper will also consider why the Bristol authorities seemed so eager to return the Africans to Spain, and the significance of the episode for the status of Africans in late Elizabethan England. Map showing Drake's voyage 1585-6. Monday 5th August 2013, 10am, Flintshire U3A, New Brighton Community Centre, Moel Fammau Road, New Brighton, CH7 6QX. Dr Miranda Kaufmann will tell the story of Edward Swarthye, one of over 350 Africans she has discovered during this period, and through his life explore how Africans came here, what work they did and what their legal status was. Camden History Society, Local Studies Centre, 2nd floor Holborn Library, 32-28 Theobalds Road, London WC1X 8PA . This talk by Miranda Kaufmann and Kate Donington will explore the presence of Africans in London during the Tudor and Stuart periods. It will also consider the ways in which London slave-owners profited from the exploitation of Africans during the slavery era. 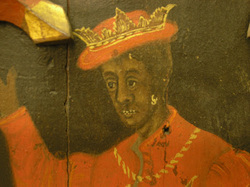 Dr Kaufmann is an expert on Africans in Elizabethan and early Stuart Britain (http://www.mirandakaufmann.com/history.html) and Kate Donington is a researcher for the Legacies of British Slave-Ownership project at UCL (http://www.ucl.ac.uk/lbs). There were Africans at the court of James IV. Centre for African Studies Seminar, Edinburgh University. Dr. Miranda Kaufmann will share the Scottish results of her research into 'Africans in Britain, 1500-1640'. The largest and best-known group revolved around the court of James IV (1473 – 1513), but Dr. Kaufmann will also present evidence of Africans in Scotland later in the century and ask how they arrived in Scotland and what their status was and whether it was any different to that of Africans in England. 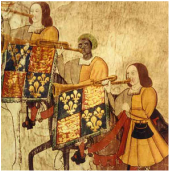 Dr. Miranda Kaufmann delivers an insightful talk on the musical contributions to royal celebrations during the 1500s, of Africans such as John Blanke, an African trumpeter who performed at the Tudor royal courts, and the 'More taubronar,' drummer to James IV of Scotland. Two British Library readers present their findings and talk about the role of our collections in their research. Miranda Kaufmann reveals how the Library manuscript collection led to her discovery of 135 Africans spending a week outside Bristol in 1590. Michael Ohajuru made use of the Library to gain an insight into the making, location and viewing of a roodscreen featuring a black magus found in early 16th century Devon.